Living Is Easy With Nice Clothes: "Is she pretty? Yes ever so." 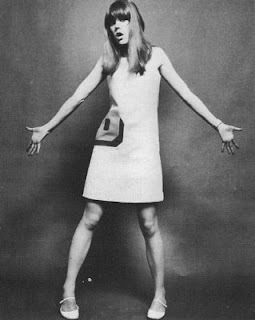 Last night I had a fabulous time at the launch of the new Foale & Tuffin exhibition and book (if you're a 1960s fiend you really must see both ASAP) where I saw lots of ultra fabulous people and briefly met the lovely Jenny Boyd. More on all of that tomorrow when I've had some rest. Pattie in F&T Double D variation. Super cool pic of Jenny in an ultra bright Funburst dress. 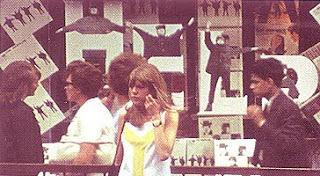 There was some footage showing at the exhibition of lots of running round this phone box in fab outfits, but I don't recall seeing Jenny wearing this one. the sisters in the window of the F&T shop. ...I'll have to do a quick raid and dig out loads more pics of F&T outfits. 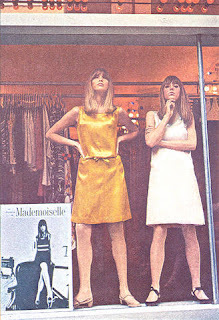 I know there's tonnes more starring Jenny, Pattie, Jane Asher and Marianne Faithfull. Noooo way you've met Jenny Boyd :O I might as well hate you right now ! ;) Just kidding. I was way more excited to meet Jenny than I was pattie, and phenomenal as Pattie is I like Jenny more. Is that wrong? Oh well. I just find Jenny easier to identify with and aspire towards if that makes any sense? Yeah it does ! It's easier to relate to Jenny, I guess. I have always related more to someone like Cynthia or Maureen than Pattie...I mean she's glamorous and all but I don't know...I found Maureen's sweetness and chirpiness more attractive !